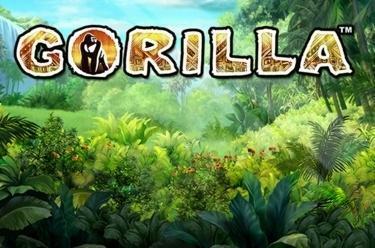 Play Gorilla™ online for free now! Here in the African bush our mighty silverback has the overview! Stick hard on his heels - our wise gorilla knows behind which jungle plants the valuable Twists are hiding! If the African map comes into play even the monkeys scream for joy: Because then you will start the free games and you can entice countless jungle Twists from the thicket. Pay attention to the mask as well, which will help you to improve your winning combos. Let the monkeys dance on 5 reels and up to 50(!) win lines! Your aim is to land 5 identical symbols along a win line. All winning patterns start on the left side of the first reel and run along the win lines to the right. Your winning combination has to recreate the win lines without being interrupted by other symbols. 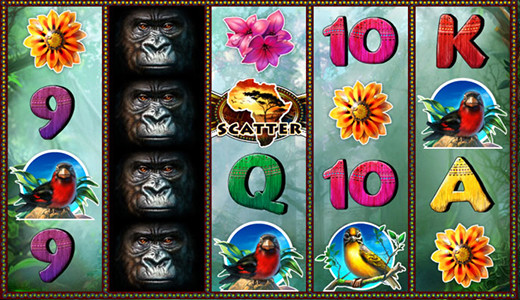 3 Africa maps (Scatter symbol) in any position conjure up 10 free games in a jiffy. You play with the settings of your last regular game round. 1 additional 'WILD' symbol will be placed on the reels per free game so your chances of taking home a big win will increase immensely! 3 Scatter symbols in the running free game win 5 additional free games the first time - afterwards this combination will pay out the value of the win without triggering further free games.